To Cite: Pasdar Y , Barzegar A, Soleymani H, Hemati Azandaryani A, Darbandi M . A Comprehensive Evaluation of Fatty Acid Content of Meat Products in Kermanshah, Int J Health Life Sci. 2018 ; 4(2):e86087. doi: 10.5812/ijhls.86087. Background: One of the main nutritionally important food compositions is fat and fatty acid. High levels of some fats leave irreversible effects on community health in the long term. The present study was conducted to determine the amount of fatty acids in meat products. Methods: In the present cross-sectional study, eight types of meat products available on the market were investigated because of their importance, including kebab, hamburger, sausage, red meat, chicken and canned tuna. For the greater accuracy of the results, three fresh samples were prepared from each product and tests were repeated. Fatty acids were extracted from oils by Folch method, and purified following extraction and methylation by AOCS method. Samples obtained were analyzed in a gas chromatography device. Results: The most frequent saturated fatty acids were palmitic and stearic acids in burgers, and palmitic and caproic acids in salami and canned tuna. The most frequent trans-fatty acid (elaidic acid) was found in burgers (15.98 ± 4.69 %). The most frequent saturated fatty acid (SFA) was found in burgers with 62%, which was significantly higher than canned tuna and salami (P = 0.012). The highest level of PUFA was observed in canned tuna (28.6%) and the lowest in burgers (4.6%) (P < 0.001). The ratio of PUFA/MUFA varied from 0.15% in burgers to 1.08% in canned fish (P < 0.001). The ratio of PUFA/SFA was favorable in salami and tuna, but low in burgers (0.07%). The ratios of PUFA/MUFA and PUFA/SFA were different in three groups of protein content foods (P < 0.05). Conclusions: The study revealed that burgers contained higher SFA and TFA levels and lower and PUFA/SFA ratio compare to other studied food groups. Including fatty acids content mainly TFA and SFAs on food labeling highly recommended to improve public nutritional knowledge for choosing safe foods. Copyright © 2018, International Journal of Health and Life Sciences. This is an open-access article distributed under the terms of the Creative Commons Attribution-NonCommercial 4.0 International License (http://creativecommons.org/licenses/by-nc/4.0/) which permits copy and redistribute the material just in noncommercial usages, provided the original work is properly cited. Cardiovascular diseases (CVDs) are the leading cause of mortality in the world, and their modifiable risk factors include the lack of regular exercise, unhealthy diet, and smoking (1). There is evidence that increased intake of dietary fat, especially saturated fatty acids (SFA) increases the risk of CVDs through increased LDL (2, 3). Excessive intake of trans-fatty acids (TFA), more than 4% to 6% of total energy intake increases LDL-C and reduces HDL-C (4). A meta-analysis estimated that that an isocaloric substitution of 2% of the total energy intake (E%) of carbohydrates with TFA corresponds to a 23% increase in the risk of CVDs (5). Fat and its building block, fatty acid, are a vital macronutrient (6). Fatty acids have key metabolic roles in the body. PUFA, especially omega 3 and 6 series are very important for biological activities and human health (7). Although humans cannot synthesize any of PUFAs’ omega 3 and 6, they become unsaturated and elongated in the human body, consequently, omega 6 turns to arachidonic acid and omega 3 becomes EPA and DHA, and thus they have been introduced as EFA (8). EPA and DHA have been known as protective factors against heart attacks, depression, cancer, and anti-inflammatory in patients with rheumatoid arthritis (9). Type and amount of fatty acids in foods are associated with people's health. In developed countries, CVD and cancer have been found to be associated with the amount of SFAs in foods (10). In the process of hydrogenation of PUFAs, TFAs are saturated by addition of hydrogen to their unsaturated bonds, and as a result, oil is converted into fat to be more stable (11). Natural carbon-hydrogen bonds are in Cis state (two hydrogen atoms on the same side of a double-bond), but during hydrogenation, some remain in Cis state and some in trans state (one hydrogen atom on the opposite side of a double-bond) (8). Many researchers have now realized that TFAs are an increasing risk factor for CVD and cancer through changing the amount and type of LDL and HDL (11). Palmitic, stearic, and myristic acids are the most common SFAs found in foods composed of meat and dairy products, and processed foods (12). Because of containing more than 50% of saturated bonds, palm oil can increase total cholesterol and LDL-C, and eventually cause coronary artery obstruction, yet because of cost-effectiveness, it is used in many food products such as meat, milk, yoghurt, and various cookies and pastries (13). A study conducted in 2009 in Iran showed that the most frequent TFA found in sausage, salami, and hamburger is elaidic acid, and the most frequent unsaturated fatty acids are cisoleic acid and linoleic acid (14). Another study reported linoleic acid as the most frequent fatty acid in sausage (15). No comprehensive study has yet been conducted in Iran on the spread of fatty acids in various processed meats. Given the above, assessment of these fatty acids in food products is necessary. Thus the present study was conducted in the city of Kermanshah to analyze and determine the credibility of processed meat products based on fatty acids. In the present cross-sectional study, eight types of meat products available in the market were investigated, including kebab, hamburger, sausage, meat ham and chicken ham, meat cocktail and canned tuna. These products were categorized in three groups of burgers, salami, and tuna. Three brands from each group and three samples from each brand were purchased from shops across Kermanshah. A total of 216 samples were assessed (for greater accuracy, three samples of fat were taken from each product and their fatty acids were extracted). Samples were selected from different producers with different production dates. Laboratory materials were procured considering their production and expiry dates, and samples were transferred to the laboratory in appropriate temperature and humidity, and kept at the right conditions until test. The packaged products were fully intact and in perfect condition, with at least one week left to their expiry date. All purchased products were produced in Iran. The brand names are kept confidential. Various chemicals were used in the present study, including chloroform solution, methanol, distilled water, nitrogen gas, hexane, tridecanoic acid, 0.5 molar methanol NaOH, methanol BF3, saturated NaCl, N-Hexane, and standard fatty acids for gas chromatography device. The samples’ fat was extracted according to Folch method (16, 17), such that 8 cc of chloroform solution and methanol at 1:2 ratio was added to 0.5 g of samples, and vortexed for 30 seconds. Distilled water was added to the solution at an amount of one fifth of the solution in each test tube. After centrifuging for three minutes at 4000 rpm, two phases were formed. The supernatant containing water and lipid impurities was discarded, and distilled water was added to each tube at an amount of one fifth of the volume again, and centrifuged, and supernatant was completely isolated and discarded. The resulting solution was dried in a hot water bath at 40°C under nitrogen stream. One cc hexane was added, and then the solution was transferred to a screw cap tube and kept frozen. Derivation was carried out according to AOCS method. First, 10 cc of encoded fats were poured into test tubes (10 cc from each sample), and 50 µL of C13 internal standard containing 5 mg of tridecanoid acid were added. To each sample, 2 cc of 0.5 molar methanol NaOH was added and after 30 seconds of being vortexed, the sample was placed in hot water bath at 100°C. Once cooled, 2 cc of 14% methanol BF3 was added, and after 30 second of being vortexed, it was placed in hot water bath at 100°C again. To the cooled solution, 4 cc of saturated NaCl and 2 cc of N-hexane were added and then centrifuged at 4000 rpm for one minute. The supernatant was removed, and the solution was placed in hot water bath to dry under nitrogen stream (18). After derivation, the amount of fatty acids in extracted fats was determined by a gas chromatograph (Varian GC-4500) equipped with flame ionization detector and a CP-Sil 88 capillary column (100 m, 0.25 mm, 0.2 μm). The split ratio was 1:100. Injector and detector temperatures were 270°C and 300°C, respectively. The following temperature program was set: 50°C for 1 min, followed from 50 to 175°C at 25°C/min, and stay at the temperature for 1 min, and followed from 175 to 220°C at 4°C/min, and finally 220°C for 7 min. Nitrogen gas with 99.99% purity and flow of 1 mL/min was used as the carrier gas. Reliability of this method has been confirmed in previous studies (19, 20). Data were analyzed in SPSS V. 21 (IBM Corporation, New York, USA). First, normal distribution of data was assessed by K-S test. Then, normal data were analyzed using parametric test of one-way variance analysis, and non-normal data using non-parametric test of Kruskal-Wallis. P < 0.05 was considered significant for all tests. 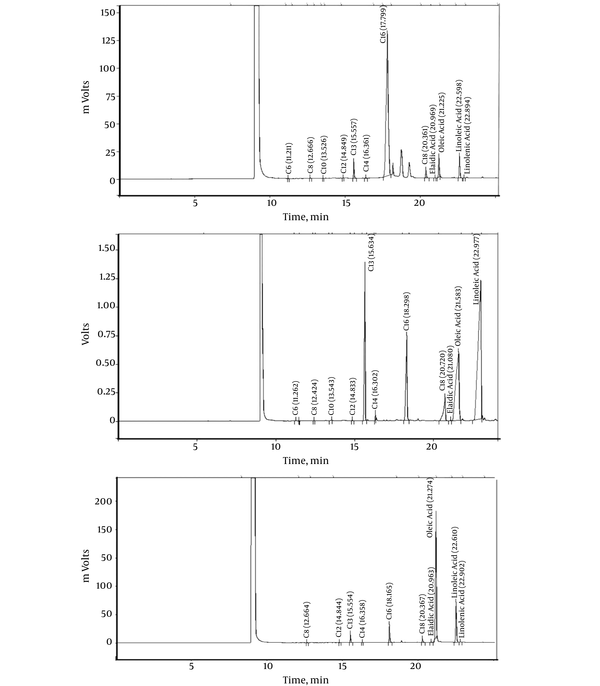 Using gas chromatography, 11 types of fatty acids in meat products in the market in Iran including burgers, salami, and canned tuna fish were assessed Figure 1. Generally, mean amount of fats was higher in burgers than that in canned tuna or salami. The most frequent fatty acids found in burgers were palmitic acid with mean 26.38 ± 16.12 percent and oleic acid with mean 25.48 ± 15.91 percent. In salami, the fatty acid was oleic acid with mean 33.64 ± 38.17 percent. In canned tuna, the most frequent fatty acids were oleic acid 27.44 ± 36.28 percent and linoleic acid 23.73 ± 21.77 percent. The most frequent trans fatty acid (elaidic acid) was found in burgers (4.69 ± 15.98 percent) followed by salami (0.35 ± 0.08 percent) and canned tuna (0.19 ± 0.15 percent). Mean percentage of caproic, lauric, myristic, palmitic, stearic, and linoleic acids was different in the three protein food groups (P < 0.05) (Table 1). The lowest percentage of SFAs was found in canned tuna (38.84%). The highest amount of MUFA was found in burgers (30.14%) and the highest PUFA in canned tuna (28.61%). PUFA/MUFA ratio varied from 0.15% in burgers to 1.08% in canned tuna. The three protein food groups were statistically different in terms of mean percentage of SFA, PUFA, PUFA/MUFA and PUFA/SFA (P < 0.05) (Table 2). Mean percentage of SFAs in burgers approached 63%, which was significantly lower in canned tuna and salami. The highest PUFA was found in canned tuna (28.6%) and the lowest in burgers (4.6%). All three groups had similar amounts of MUFA. A study conducted in Spain assessed two meat products, including dry-cured ham and Cecina, and reported mean percentage of combined SFA and MUFA 43% of total fatty acids, and PUFA 14% (21). Another study found mean percentage of SFA 35% to 40% of total fatty acids in dry-cured ham, MUFA 45% to 50% and PUFA 10% to 15% (22). In the present study, oleic acid was the most prevalent fatty acid in all three groups of meat products, and this has been reported by most studies conducted to measure fatty acids in meat products (21, 23). The most frequent SFAs in burgers included palmitic acid and stearic acid. The most frequent SFAs in salami and canned tuna were palmitic acid and caproic acid. A study conducted by Fernandez et al. showed that SFAs in sausage samples included 46.5% oleic acid and 27.5% palmitic acid (21). The highest amount of MUFA was found in burgers, with no significant difference with the two other groups. Research shows that MUFA has a neutral effect on blood cholesterol, or gradually causes hypocholesteremia, and although does not reduce total cholesterol, reduces LDL and increases HDL (24, 25). The most frequent PUFA found in meat products was linoleic acid (23.7%). PUFA was significantly different in three groups (P < 0.001), and the highest in canned tuna (28.6%). A similar study reported Linoleic acid (14%) as the highest PUFA (18), which suggests high levels of PUFA in the present study. Today, nutritionists rather focus on PUFA/SFA balance than absolute PUFA or every single fatty acid. PUFA-rich regimens reduce blood LDL cholesterol, while SFA has different effects. Therefore, for a healthy diet, PUFA/SFA > 0.4 is recommended (26), and in the present study, this ratio was favorable in salami and canned tuna, but low in burgers. Trans-fatty acids in processed foods increase the formation of cholesterol-rich LDL particles and reduce concentration of HDL, leading to increased risk of CVDs (27). An interventional study showed that TFA increases CVDs by increasing dyslipidemia, moreover, TFA has a greater effect on cholesterol in older obese people compared to normal-weighing young people (28). It is estimated that replacement of 1% of TFA by SFA, MUFA, and PUFA increases TC/HDL-C ratio by 0.031, 0.054, and 0.067, respectively (29). In the present study, trans-fatty acid in burgers was high, which requires greater attention in production stage of these products. Evidence shows that the fat content of food has a major role in the prevention and treatment of a number of chronic diseases, especially CVDs. Thus, optimal intake of all SFAs and non-SFAs has been recommended by nutrition organizations including WHO. The amount of fat in food should be between 15% and 30% of total dietary energy; SFA should not exceed 10%, non-SFA (PUFA) between 6% and 10%, non-FASs (MUFA) 10% to 15%, and trans-fatty acids less than 1% (12, 26). The present and other studies conducted in Iran have revealed high levels of fatty acids in meat products (30, 31). These meat products are currently very popular because they can be prepared very quickly and are suitable for families who have no time to prepare home-made foods. Besides, these products are very popular among children and adolescents. Therefore, it is essential that greater attention be paid to preparation and formulation of these food products at production stage. We gratefully acknowledge the Research Council of Kermanshah University of Medical Sciences (grant number: 94362) for the financial support and Research Center for Environmental Determinants of Health in School of Health. Funding/Support: Grant number: 94362 from Research Council of Kermanshah University of Medical Sciences. 1. Clark ML, Butler LM, Koh WP, Wang R, Yuan JM. Dietary fiber intake modifies the association between secondhand smoke exposure and coronary heart disease mortality among Chinese non-smokers in Singapore. Nutrition. 2013;29(11-12):1304-9. doi: 10.1016/j.nut.2013.04.003. [PubMed: 23911218]. 2. Ozcan M, Ayaz FA, Ozogul Y, Glew R, Ozogul F. Fatty acid composition of achenes of Cirsium taxa (Asteraceae, Carduoideae) from Turkey. Z Naturforsch C. 2016;71(3-4):45-54. doi: 10.1515/znc-2015-0128. [PubMed: 26959539]. 3. Martemucci G, D'Alessandro AG. Fat content, energy value and fatty acid profile of donkey milk during lactation and implications for human nutrition. Lipids Health Dis. 2012;11(1):113. doi: 10.1186/1476-511X-11-113. [PubMed: 22963037]. [PubMed Central: PMC3545721]. 4. Takeuchi H, Ito E, Tomioka T, Tabuchi E, Fuhshuku K, Asano Y. Trans fatty acid intake and serum cholesterol levels in young Japanese women. Biosci Biotechnol Biochem. 2012;76(9):1627-32. doi: 10.1271/bbb.120105. [PubMed: 22972348]. 5. Mozaffarian D, Katan MB, Ascherio A, Stampfer MJ, Willett WC. Trans fatty acids and cardiovascular disease. N Engl J Med. 2006;354(15):1601-13. doi: 10.1056/NEJMra054035. [PubMed: 16611951]. 6. Gramlich L, Meddings L, Alberda C, Wichansawakun S, Robbins S, Driscoll D, et al. Essential fatty acid deficiency in 2015: The impact of novel intravenous lipid emulsions. JPEN J Parenter Enteral Nutr. 2015;39(1 Suppl):61S-6S. doi: 10.1177/0148607115595977. [PubMed: 26187936]. 7. Kocatepe D, Turan H. Proximate and fatty acid composition of some commercially important fish species from the Sinop region of the Black Sea. Lipids. 2012;47(6):635-41. doi: 10.1007/s11745-012-3658-1. [PubMed: 22322400]. 8. Mahan LK, Raymond JL. Krause's food & the nutrition care process-e-book. Elsevier Health Sciences; 2016. 9. Brugiapaglia A, Lussiana C, Destefanis G. Fatty acid profile and cholesterol content of beef at retail of Piemontese, Limousin and Friesian breeds. Meat Sci. 2014;96(1):568-73. doi: 10.1016/j.meatsci.2013.08.012. [PubMed: 24018276]. 10. Yu K, Shu G, Yuan F, Zhu X, Gao P, Wang S, et al. Fatty acid and transcriptome profiling of longissimus dorsi muscles between pig breeds differing in meat quality. Int J Biol Sci. 2013;9(1):108-18. doi: 10.7150/ijbs.5306. [PubMed: 23355796]. [PubMed Central: PMC3555150]. 11. Kroustallaki P, Tsimpinos G, Vardavas CI, Kafatos A. Fatty acid composition of Greek margarines and their change in fatty acid content over the past decades. Int J Food Sci Nutr. 2011;62(7):685-91. doi: 10.3109/09637486.2011.568473. [PubMed: 21568823]. 12. Mensink RP. Dairy products and the risk to develop type 2 diabetes or cardiovascular disease. Int Dairy J. 2006;16(9):1001-4. doi: 10.1016/j.idairyj.2005.10.013. 13. Mancini A, Imperlini E, Nigro E, Montagnese C, Daniele A, Orru S, et al. Biological and nutritional properties of palm oil and palmitic acid: Effects on health. Molecules. 2015;20(9):17339-61. doi: 10.3390/molecules200917339. [PubMed: 26393565]. 14. Asgary S, Nazari B, Sarrafzadegan N, Parkhideh S, Saberi S, Esmaillzadeh A, et al. Evaluation of fatty acid content of some Iranian fast foods with emphasis on trans fatty acids. Asia Pac J Clin Nutr. 2009;18(2):187-92. [PubMed: 19713177]. 15. Eskandarion MR, Najafi M, Teimouri M, Parto F. [Study of saturated and unsaturated fatty acids in certain foods of Iran]. Razi J Med Sci. 2016;23:1-10. Persian. 16. Bahrami G, Bahrami S, Bahrami MT, Pasdar Y, Rezaei M, Darbandi M. The trans fatty acid content of snacks offered in Kermanshah. Int J Health Life Sci. 2015;1(1):17-23. 17. Bahrami G, Pasdar Y, Rezaei M, Rahemi P, Hagh Nazari L, Niazi P, et al. [The study of fatty acids composition in some of distributed in Kermanshah using the gas chromatography]. J Clin Care. 2014;2(4):22-31. Persian. 18. Nazari B, Asgari S, Sarafzadegan N, Saberi S, Haji Hosseini R, Azhari A. Determination of fatty acid profiles in ghee and olive oil with emphasis on trans fatty acids by gas chromatography. Shahrekord Univ Med Sci J. 2009;10 (Suppl 1)(4):57-63. 19. Santos LAT, Cruz R, Casal S. Trans fatty acids in commercial cookies and biscuits: An update of Portuguese market. Food Control. 2015;47:141-6. doi: 10.1016/j.foodcont.2014.06.046. 20. Costa N, Cruz R, Graca P, Breda J, Casal S. Trans fatty acids in the Portuguese food market. Food Control. 2016;64:128-34. doi: 10.1016/j.foodcont.2015.12.010. [PubMed: 27274619]. [PubMed Central: PMC4763144]. 21. Fernandez D, Menendez RA, Sanz JJ, Garcia-Fernandez Mdel C. Fatty acid profile of two cured meat products: Dry-cured ham and cecina. Nutr Hosp. 2015;32(1):367-72. doi: 10.3305/nh.2015.32.1.8911. [PubMed: 26262740]. 22. Bermudez R, Franco I, Franco D, Carballo J, Lorenzo JM. Influence of inclusion of chestnut in the finishing diet on fatty acid profile of dry-cured ham from Celta pig breed. Meat Sci. 2012;92(4):394-9. doi: 10.1016/j.meatsci.2012.05.001. [PubMed: 22682688]. 23. Jimenez-Colmenero F, Ventanas J, Toldra F. Nutritional composition of dry-cured ham and its role in a healthy diet. Meat Sci. 2010;84(4):585-93. doi: 10.1016/j.meatsci.2009.10.029. [PubMed: 20374828]. 24. Lecerf JM. Fatty acids and cardiovascular disease. Nutr Rev. 2009;67(5):273-83. doi: 10.1111/j.1753-4887.2009.00194.x. [PubMed: 19386031]. 25. Kris-Etherton PM, Yu S. Individual fatty acid effects on plasma lipids and lipoproteins: Human studies. Am J Clin Nutr. 1997;65(5 Suppl):1628S-44S. doi: 10.1093/ajcn/65.5.1628S. [PubMed: 9129503]. 26. Nelson G, Chamberlain J. The effect of dietary alpha-linolenic acid on blood lipids and lipoproteins in humans. Flaxseed in human nutrition. Champaign, Illinois: The American Oil Chemists' Society Press; 1995. p. 56-81. 27. Reitsma PH, Brouwer IA, Wanders AJ, Katan MB. Correction: Effect of animal and industrial trans fatty acids on HDL and LDL cholesterol levels in humans – a quantitative review. PLoS ONE. 2010;5(10). doi: 10.1371/annotation/c4cf3127-89b2-4d58-abf3-ab0746342a90. 28. Bendsen NT, Chabanova E, Thomsen HS, Larsen TM, Newman JW, Stender S, et al. Effect of trans fatty acid intake on abdominal and liver fat deposition and blood lipids: A randomized trial in overweight postmenopausal women. Nutr Diabetes. 2011;1(1). e4. doi: 10.1038/nutd.2010.4. [PubMed: 23154296]. [PubMed Central: PMC3302130]. 29. Mozaffarian D, Clarke R. Quantitative effects on cardiovascular risk factors and coronary heart disease risk of replacing partially hydrogenated vegetable oils with other fats and oils. Eur J Clin Nutr. 2009;63 Suppl 2:S22-33. doi: 10.1038/sj.ejcn.1602976. [PubMed: 19424216]. 30. Nazari B, Asgary S, Sarrafzadegan N, Saberi S, Azadbakht L, Esmaillzadeh A. [Evaluation of types and amounts of fatty acid content in some most consumed Iranian fast foods]. J Isfahan Med Sch. 2009;27(99). Persian. 31. Pasdar Y, Bahrami G, Karvand F, Khodadoost M, Rezaei M, Niazi S. [Determining the fatty acid content of the most common meat products in Kermanshah, Iran]. Jorjani Biomed J. 2014;1(1):42-51. Persian.